Well spring is here, or has spring sprung. Hell I just barley remembered to spring forward and set my clock ahead 1 hour. It's been a long winter and I'm ready to get back to racing. Points starts next week so I took the Blue Dunebuggy for a little practice to get ready. Currently running the 2007cc engine. Made 4 passes and broke a CV joint doing an awesome wheelie. Best pass of the day 14.294 @ 88.50 MPH. Hot Damn...the 'RacerDave Racing Report' is Back Again for another year! Hopefully we can get a good showing... last time was fun but not very many people.... more people are now active so maybe law of averages will kick in. All the concreat pit parking will be hogged up by the guys with 1/2 million dollar motor homes. There is always plenty of parking on the big end along the fence, or between the bleachers. Walking up to help spot my Dad. Were having liver and onions for dinner. That's amazing them skinny little slicks were able to pull the front up! Ghia runs good on the street, but when I smash the gas and run full throttle at the track the dual 48 IDA's are hanging up. Don't know what's going on so I'll have to take them apart and look. Car never ran consistant. Lost first round by 2 car lenghts. Didn't do any better in the buy back round and lost again. Guess I'll have to park the Ghia and try again next week with the Roadster. No racing at TVRP so I'm thinking road trip. You need to win one of these! RacerDave is getting even more Famous! man baja herbie i remember that guy! Friday 4-23-2010 Test 'n Tune at TVRP. Needed some practice as I have not got off to a great start this year. Took the Blue Dunebuggy with the 2007cc. Buggy ran very consistent with a 14.63, 14.64, 14.64, and a 14.68. Also had fairly good reaction times. Dusted off the roadster and went to race. I wanted to get fired up and win so I thought it was time to go fast. Running the 1915cc with the big dual 48 IDA's. A little windy today and slowing me down. Lost 1st round and just couldn't run my dial in and got beat by .027 seconds. Bought back in for 2nd round. Got to the water box and had a bad oil leak and was DQ's. Stupid valve cover gasket shrunk from sitting in the trailer all winter. Got home at 11.00 and changed them with my flashlight. SandDude's father won his class with his Chevy Cavalier. Hope some of the luck can rub off on me. Never let a $3 part get you down. New gaskets in the Roadster and the wind come sweeping down the plains. Had a strong tail wind pushing me down the Kansas track and I ran the fastest ET with the 1915cc engine. Made 3 time trials and was ready to race. No oil leaks and still plenty of wind. 25 cars were in my class. Won 1st round against a Chevy P/U when he red light. Raced 2nd round against a Old Red Ford Falcon with an easy win coasting across the line. Another easy win coasting across the line 3rd round against a Red Mustang. I had the best reaction time of the round earning me the bye run 4th round. Lined up in the semi final with a Red Chevy II dialed in at 11.91 and he red light giving me the win. Wind still blowing strong and I'm hoping it doesn't change. Final round I raced the same Ford P/U truck I beat in the 1st round. He left 1st and I chased him down. I had a bad R/T and broke out and lost for a runner-up finish. Best pass of the day was a 12.753 @ 103.16 MPH. Finishing 2nd ain't so bad when you bring home some cash. Gotta go do the laundry. Did the winning ca$h pay for the gas up to Kansas & back? while delivering mail around 2:00pm it look gloomy weather and I wasn't sure if we were going to race. Headed to the track after work with the Ghia on the tow bar. Jacked it up and installed the Phoenix F/X drag slicks and made a few time trials. Didn't have very good reaction times but got lucky 1st round when the dude in the Chevy I was racing went red. 2nd round was my turn and I went red. Bummer. I was hoping to go a few rounds to make up some points. I'm in like last place with the bad start I'm having this year. If you guys want to have a cruise to the track May 15 is the big race with the extra nostalgia cars and the 10.5 tire nitrous guys. Somebody can figure out a place to meet.Time trials start at 4:00pm. racing starts around 6:00 or so. $10.50 to watch. Last edited by SandDude on Mon May 03, 2010 10:10 pm, edited 1 time in total. man dave, hit that thing with the buffer! Got beat up real bad. Two times in one night. Jap slapped and rolled down the highway. Lost by .019 and .040 in 2 tries at the 1/4 mile. I'm in like last place in points. Need some luck and some Mojo. Ran a 14.25 @ 93.70 MPH the fastest pass ever in the Ghia. Still not ready to quit. Can't let the Camaro's get the best of me. I'll regroup and try again. I AIN'T SKEERED. Not very many people showed up because of bad looking weather, but I'm here. Gas and air and I'm ready to race. 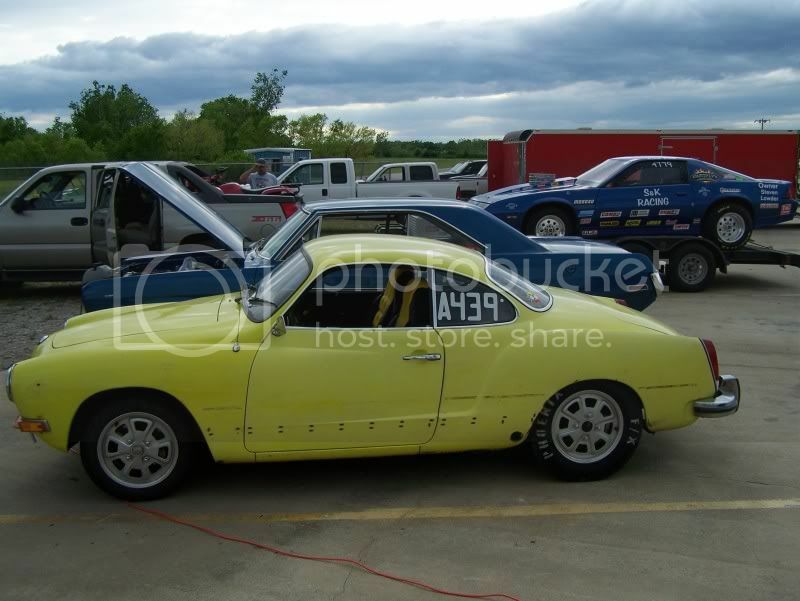 Made 3 time trials and the Ghia running pretty good. Raced a Brown Camaro 1st round and he red light. Lined up with a huge Dually diesel P/U and beat him when he broke out. Ran Jesse in his Mustang in the Semi final and lost by .085 seconds. All in all not a bad day any time I can go 3 or more rounds. Some 15 year old girl brought her father over to look at my Ghia because she wants one so bad. I let her sit in it and now I think her dad will have to get her one. They saw that green '58 for sale in Noble. Got any events your racing at in June? We need to get a cruise together. I wonna see that ghia run! June 12th bracket race, June 13th is the Import Shootout, June 19 is bracket race. It's been a few weeks since I raced. Track has scheduled other stuff that I didn't fit into. Took the Blue Dunebuggy just to get a few practice laps and get back into the groove for racing. Changed to smaller venturies and re-jetted my 44 IDF's and the Dunebuggy ran exactly the same times it did last time I raced it.Things went smooth and car ran great. Best pass 14.243 @ 90.15 mph. Back to the Ghia. Drove it around some on the street the other day and ran fine. 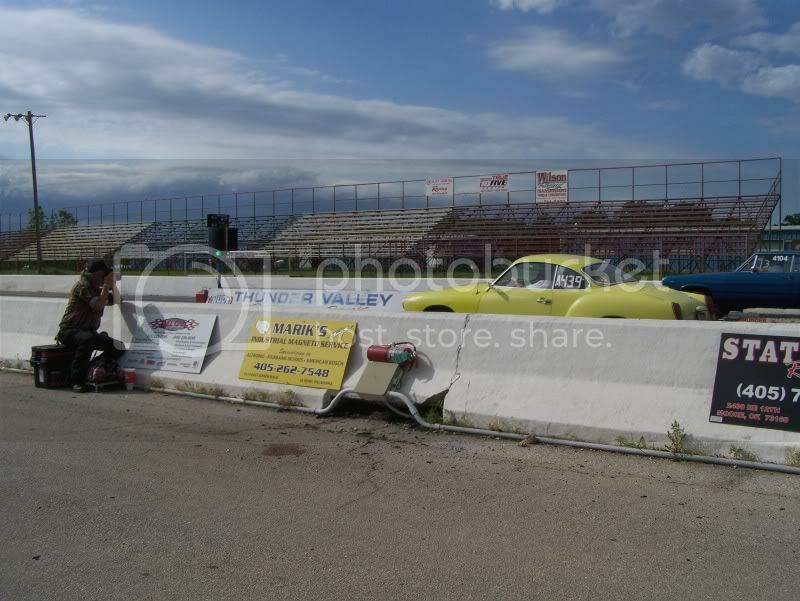 Made 1st time trial and Ghia ran like crap. Thought it might just be the heat, but it never got better. Didn't have any tools or parts but suspect that I fouled a plug and need to replace them. Got a Bye run 1st round so I had a free chance to see what the car would run crippled. 2nd round didn't have any luck and got beat by a Dodge Dart. There wasn't a best pass, they all sucked. Here we go, the once a year circus with all the Honnnnda dudes that don't have a clue. Rolled in with the Blue Dunebuggy as it ran great Friday night and didn't have time to work on the Ghia. Made 4 time trials, looked at the car show, watched the bikini contest, and ate a hamburger. 1st round I wasn't focused clearly as I knew I could just cruise through the field and win like the last 3 years. Red light start and game over. At least I lost to a water cooled VW. Did I mention there was a girl from Texas in the Bikini contest. We all know things naturally grow big in Texas. Why are they called a "motorcycle" when they have an engine in them? Got the Karmann Ghia all tuned up. Changed the NGK spark plugs, Brad Penn oil, and adjusted the valves. Towed it to the track and bolted on the Phoenix drag slicks. Ran 1st time trial and car ran a 14.57 in the 95* heat. 2nd time trial was 14.55 so I'm thinking car is ready to race. 1st round raced a Camaro and won when he red light. 2nd round I beat a guy in a '36 Chevy pick-up. 3rd round they called us to the lanes and we sat and waited for 30 minutes. Lined up against a Blue Malibu. Humidity was horrid and I missed my dial-in and lost because car slowed down and I couldn't run the number. Oh well predicting the weather changes is part of winning and the humidity changes effects these air cooled engines a lot. 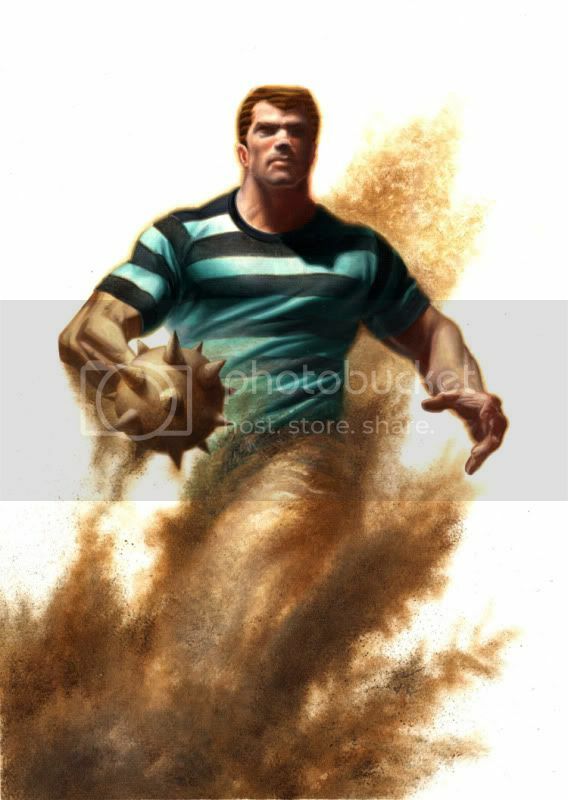 Sanddude's father made it to the final in his Chebby Cavalier and was runner-up. Did a horrible job of driving, got beat real bad and am very frustrated. I have nothing left to brag about so this will probably be my last update. 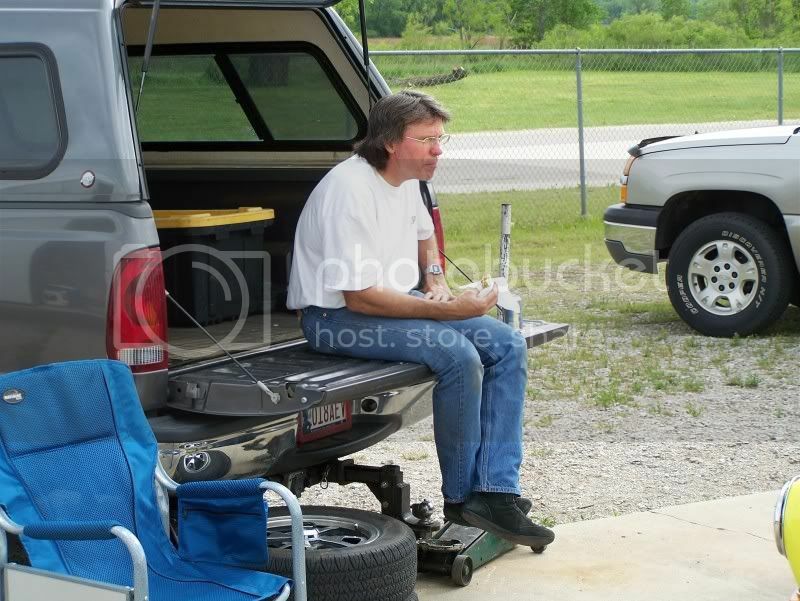 BTW this is the guy that you got the irs swing axle from in North okc by edmond a few months ago. Take a break from racing & go off-roading w/ me! I quit posting for a while because I got tired of talking. At the Tulsa show yesterday several people told me they were not tired of listening and missed my updates. Left Tulsa at high noon and drove home and hooked up the Blue Dunebuggy and headed to the track. Made a few time trials and the Buggy was wheeling like a mad man, 3 feet off the ground ( I have witnesses). Made it 4 rounds all the way to the final. Lined up first round and won when my opponett broke out by .005 seconds. Coasted across the line 2nd round for an easy win by .156 seconds. 3rd round raced SandDudes brother Jeff and won when he broke out by .001 seconds. Got real sloppy in the final against a Camaro and lost. When I launched the Buggy and it wheelies to the sky it jerked be back and I pulled the shifter right out of gear into neutral and the Camaro drove right on by for the win. Oh well, 2nd place ain't so bad when you gotta go upstairs and get a check. where are the wheelie pics!? At the Tulsa show yesterday several people told me they were not tired of listening and missed my updates. I said the same thing.... glad to have the update back! Going north at 7:45 a.m. and here come the Sooners. Saw the OU football team heading home. They have as big semi truck to haul the equipment and 2 charter buses following behind. Made it to Kansas and lined up for my time trials. Cooked up a hamburger on my Coleman camp stove and was ready for 1st round. Lined up against a Black Dodge Challenger and coasted across the line for an easy win. Raced a Red Mustang 2nd round and lost by .002 seconds. Bought back in for 3rd round and raced a Blue Lincoln and got him across the finish line by .146. Next came a Red Chevy II and didn't have any trouble beating him by .056. Now the final round and all that's left is me and the guy that just won the Division 5 Championship. I wheelied hard and grab all the gears but the Blue Malibu got me at the end by.129 seconds and I was runner-up. Congrats on a near Win! Going North for a 2 day road trip in the wheat fields of Kansas for my last race of the year. Got all set up and ready to dance. The wind was sweeping down the plains and the Roadster with 1915cc was running great. Made my 2nd time trial and at the end of the track my car made bad noise and I knew the engine was hurt. Limped back to the pits and found that my #3 header bolt fell out causing my header to leak real bad. Got that fixed and ready to race. 17 cars today and I'm the only VW. Lost 1st round against a Chevy when I broke out. Not really the way I wanted to start out. Bought back in and won 2nd round against a Chevy P/U truck. 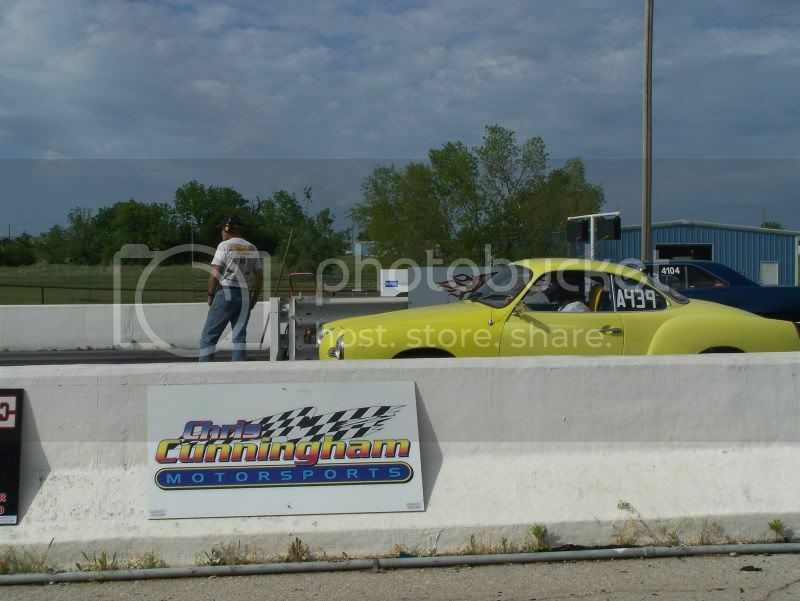 Raced a Chevy 3rd round and won. 4th round lined up with a Red Z28 Camaro and he red light. 5th round I got the bye run and a free pass into the final round. Had a Ranchero in the final and he cut a red light and I won. WOOO HOOO racer Dave wins and takes home the money. Best pass of the day a 12.870 @ 98.66 MPH. OK super troopers and boys and girls young and old alike,I've been keeping a little secret. I've been doing pretty good up in Kansas this year and have not mentioned anything about points because I didn't want to jinx myself. With the Sat. win and winning 2 rounds on Sunday I locked up the points and won the championship in my class. Yes that's right I won the track points championship in Intermediate class racing my VW against all the Fords, Chebbys, pick-ups, and even a few girls. What do you think about them apples? Going through some serious withdrawal from not being able to race. Started the race car and let it run for 10 minutes just to keep the battery charged up and the moisture boiled out of the oil. Headed up to Kansas for the 2010 Mid-America Dragway championship awards banquet. We all gathered at the track for a pot luck dinner and awards. Food was great, it's always fun to eat good home cooked stuff. All the champions and top 5 drivers of each class received a trophy, jacket, and a check. As you all remember I won the Sportsman class Championship. After the awards some of the racers had a little tournament with a practice tree to see who could get the best reaction time. Then they had a baby shower for 2 of the track employees that were expecting, but I didn't hang round for that with a 2 hr drive back home. I had a rough year racing but pulled off a pretty good finish. Racing starts again in March. See y'all then. Git em! in 2011 Dave!